Holocaust Survivors: Photo Gallery - "Great Synagogue of Czestochowa I"
Czestochowa was celebrated as a center of Catholic pilgrimage, the home of the shrine of the Jasna Gora, the Black Madonna. Yet Jews played an important role in its commercial and cultural life. In 1939 there were 28,500 Jews living there. The German army entered the city on the third day of WWII, September 3, 1939. The next day a bloody pogrom, later called " Bloody Monday," took place. 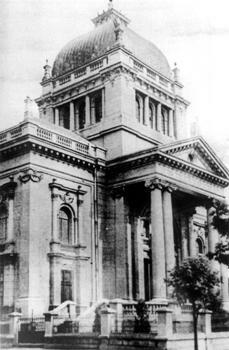 On December 25, 1939 a second pogrom took place, and the Great Synagogue was set on fire. After the war in June 1946, 2,167 Jews had returned to Czestochowa to rebuild their community. Almost all Jews left Poland after the anti-Semitic campain of 1968.